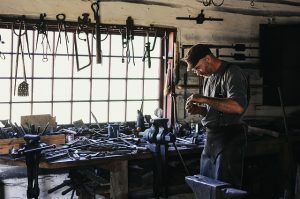 Cottage Industry, or the “Putting Out System” is a production system of producing goods that relies on producing goods, or parts of goods, by craftsmen at home, or small workshops, instead of large factories. “Cottage Industry” describes the methodology that was used to produce most goods throughout human history, up until the end of the Industrial Revolution. Under this system, if a person or government wanted to make a large number of a particular item (for example, a government ordering 1000 military uniforms), instead of building a large factory and hire a large workforce, they would hire a many contractors to produce a small number of the items each (in this example, the government would ask 100 sewers to make 10 uniforms each). The contractors would then create the goods at home, or their “cottage”, and deliver them upon completion. The major advantage of this system is that it allowed farm workers to continue producing food and other agricultural goods, while filling their orders of finished goods during the time between planting and harvest. Another major advantage was that until very recently, most of the world’s population did not live in or near towns and cities, but rather in small farming villages. This system allowed the creation of goods across a very large area without requiring the population to travel to central factories every day. After the Industrial Revolution, many goods that were formally produced using cottage industry were moved to factories, which benefited from a division of labor and a steady workforce. However, since most products are produced in stages, each stage moved between “cottage production” and “industrial production” in stages as well. In the examples of producing a shirt, first the cloth needs to be made from cotton, linen, or wool, then the cloth needs to be cut and sewn into a shirt. If the shirt has buttons, those buttons need to be produced out of metal, then sewn on to the shirt. In a classic cottage industry, a farm would sell the cotton, linen, or wool to many “cottages”, who would then spin it in to yarn, use a loom to create fabric out of the yarn, then cut and sew the fabric into a shirt. If they needed buttons, they could buy them from another “cottage” that produced buttons, then sew them on to the shirt. When the industrial revolution started, it began with the production of textiles and fabrics. This means a large factory would buy the cotton, linen, and wool from farmers to turn into fabric, then sell the textiles to “cottage producers”, who would complete the remaining steps. Next, new industrial processes allowed the creation of metal goods in factories instead of a blacksmith’s shop. This means that one factory would produce the fabric and another would create the buttons, and both send it to “cottage producers” to complete. When the sewing machine was developed, the entire process was fully industrialized – one factory would create the fabric, another would create the buttons, then both would send their products to a third factory which cut and finished the shirts. The centralization of production allowed much more products to be produced much faster, and since the “middle products” (fabric and buttons in this example) did not need to be shipped in small quantities to dozens of locations, cost also dropped significantly. Even though most goods are now mass-produced, goods made by hand (or done using “cottage production”) can still be seen as a sign of higher quality. For example, expensive business suits are still generally made by hand by experienced tailors, and expensive shoes are often made by hand by expensive cobblers. In the last few years, many “cottage producers” have begun selling their goods on the internet (like Etsy.com, which can be traded on HowTheMarketWorks with the symbol ETSY, which is entirely dedicated to cottage production), which has led to a resurgence of cottage industry for custom and hand-crafted goods. However, transitioning away from cottage production to industrial production for most goods is still seen as a very important step for developing countries.